As many of you may know my mother, Teresa Willis (Teri ) is in need of a lung transplant. She has lived in Elyria for 30 years, 10 of which were spent working at Speedway, working her way from cashier to assistant manager. 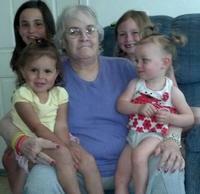 In her life is a husband, 2 two daughters, seven grandchildren and a mother that she helps frequently. She was diagnosed with COPD (chronic obstructive pulmonary disease) that has caused life threatening damage to her lungs. Teresa is on oxygen 24 hours a day, with the only option being a transplant. She is being evaluated at the Cleveland Clinic for the transplant which will improve her quality of life. We are asking for the help and prayers of family, friends, and the community at this difficult time. Teresa’s family and friends have volunteered to raise funds to help with expenses for surgery and after care. This will help defray the cost of medicines transportation costs, and any pre-surgery expenses. To help offset her uninsured costs, a fundraising campaign has been established with HelpHOPELive, a nonprofit organization that has been assisting the transplant community for 30 years. All donations are tax deductible, are held By HelpHOPELive in the Great Lakes Lung Transplant Fund and are administered by HelpHOPELive for transplant expenses only. Teresa has the opportunity to get a double lung transplant which will give her the chance to enjoy her family life. The opportunity is there, but she needs your help. Please consider a tax deductible donation. For credit card contributions, please select the DONATE NOW button or call 800.642.8399. Together we can make a difference by assisting Teresa during this difficult time. Thank you in advance for your generosity and support.